Staggering laminate floor is it really necessary? Not staggering laminate floor such as running the boards wall-to-wall in a hall often results in problems. It is not unusual to go into a residence to check out a problem laminated installation where the boards are moving and separating. Often one of the problems found is the installer failed to leave the proper stagger or chose not to stagger areas of boards. The fail to stagger is most often seen in halls where the installer cut all of the boards the same length from wall-to-wall. Laminate flooring manufacturers require their floors to be staggered anywhere from 6 to 12 inches or more. (See manufacturers installation instructions.) Some people are of the belief that manufacturers require stagger to create waste that requires you to purchase more material. I hate to tell you, but this is not a conspiracy. The difference in the amount of plank you will use is small, for what you cut off one end will be used to start a different row of planks. A floating floor that is not staggered will not only look odd it will not perform well and as it expands it can even lift up like a hinge. Staggering laminate floor properly will had strength and structural stability. Not staggering laminate floor will compromise its stability. Laminate flooring is a floating floor. When you have areas of boards that are not staggered such as seen in the photo, you have created areas that tend to move as a separate unit. Some people don’t stagger the boards because they think it looks better. Most times though the installer thinks that not staggering laminate floor takes less time. It may take less time when first installed but when it has to be replaced it will take not only additional time, it will also require expense for the new planks. A short staggering laminate floor is not quite a bad as no staggering laminate floor though it creates similar problems. With a short stagger you have both an appearance problem and a stability problem. Again this is a floating floor that needs to float as a unit. Short stagger often leads to gaps. If you have a laminate flooring problem and it has not been installed to the standards of the laminate flooring manufacturer, the laminate may not be warranted. Staggering laminate floor really is important so do it!!! Recently I rented a home that just had laminate flooring installed. The flooring was not installed correctly and it is beveling and there are spots that look like bubbles in some areas at the edges. The floor boards have not been staggered and show warping. This concerns me a great deal. I have only lived in the home one month. I have showed the landlord the flooring and honestly they just scratched their heads and did not address the issues. I took photos of the flooring and submitted my concerns. I was also told when the flooring was buckling “that as soon as the moisture leaves the floors will seal” is this true? The way you describe this floor it has already failed and was certainly installed to fail. Whoever told you that as soon as a floor buckles it will seal when the moisture leaves is ignorant when it comes to floors. I am not an attorney and cannot give legal advise. If it were me I would take every effort now to protect myself from a future claim. I would hold onto copies of those photos, letters to the landlord and even this submission to laminate floor problems in case the landlord tries to blame you for this floor failure. If the landlord is smart they will go after the responsible person now. My guess is that they installed the floor themselves. Good luck to you! You are correct that you do not want to use a plastic vapor barrier over wood floor. As far as padding, The manufacturer of the laminate floor you select, is most likely going to require that you use a cushion under it. You don’t need to use a thick type of cushion “pad.” Without a pad you are likely to experience problems with a floating floor unless it is one approved to be installed without pad. You also might want to consider using a glue down engineered floor without pad. We installed a laminate floor for a client and he wants us to replace the entire floor because…some of the boards are shorter than the manufacturer recommended space of 12″ between adjacent boards and therefore, his warranty is apparently void. There is actually nothng wrong with the floor itself. Is this something you’ve come across and is it a reasonable request? The warranty may or may not be void. 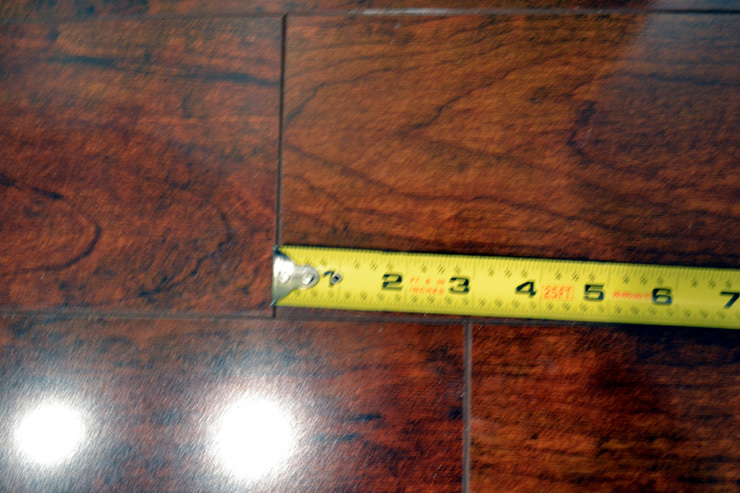 A manufacturer may list the stagger as a “recommended” space between joined planks. Other manufacturers may list it as a “required” minimum stagger. Proper stagger serves a couple of purposes. One is that of appearance and the other is that of adding stability to a floating floor. If a few boards are less than the stagger the manufacturer has requested the warranty would likely not be voided. On the other hand if the stagger is so short that board ends are nearly across each other, this can be a real problem. If boards are installed without stagger, something I have seen many times in a hall because the installer was taking short cuts, the problem becomes even more severe. My suggestion is that you thoroughly read the manufacturers warranty and installation instructions and then speak with the manufacturers warranty or claims department to see if the warranty is truly voided or how you can correct the floor without voiding the warranty. Thank you very much Terry, much appreciated. My last question as I was on a site visit yesterday was – they claim since the baseboards do not sit completely flush on the floor – that is – in some areas it is flush in others, there are minor gaps – then this means we did not float the floor correctly. We floated and used the 10 foot beam as a guide and from what I saw, all the low spots were corrected. Finally, are there any courses to train non installers on these issues? I recently had a laminate floor installed in my living/kitchen area, the floor was not installed to the manufacturer installation instructions, (IMPORTANT: When laying out planks, always stagger the end joints from row to row by at least 12″ to ensure structural integrity) I have several areas throughout where the boards are staggered 2″ to 8″ apart and 3-4 boards wide (stair step pattern), I was told by the installer it is acceptable, these locations the floor moves when walking over, the seams also have lifted in these locations and continue to get worse. Can I get a professional opinion? I have not seen serious problems with a laminate plank stagger of 5 to 6 inches that size is usually more of an appearance issue. If you have a lot of really short stagger though it can result in more joint movement. To me it sounds like your installer did not know how to read and follow installation instructions and the movement it probably related to something such as one or more boards being pinched against a wall or other fixed object or a subfloor that does not meet flatness requirements.